U.S. Representative Rashida Tlaib will ask her colleagues on the House Judiciary Committee to begin impeachment proceedings for President Trump. Tlaib, a first-term Democrat from Detroit, said Wednesday she’ll introduce a resolution later this month. It will ask the Judiciary Committee to investigate grounds for impeaching the president. Tlaib is already on the record as supporting impeachment. She says that by not fully divesting from his business interests, Trump has set up a situation where patrons can buy influence with the U.S. government— including foreign officials, in violation of the emoluments clause of the U.S. Constitution. Some fellow House Democrats have advised caution, and holding off on the possibility of impeachment proceedings until Special Counsel Robert Mueller finishes his investigation into Russian interference in the 2016 election. But Tlaib says some Democratic colleagues have approached her about potentially co-sponsoring the resolution, and the time to move is now. “This is historic. This is unprecedented,” she said. The White House did not immediately respond to a request for comment. A Republican congressman from Texas wants Democrats to block an official trip to Palestine being planned by U.S. Representative Rashida Tlaib for herself and some congressional colleagues. A Muslim woman from Detroit has won the congressional seat long held by Democratic Rep. John Conyers, who stepped down amid sexual harassment claims by former staffers. 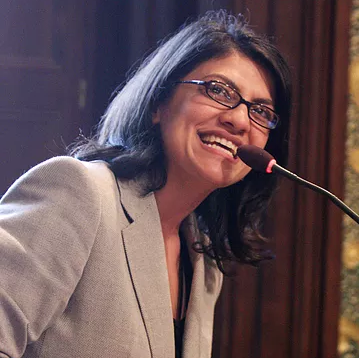 Democrat Rashida Tlaib was elected to represent Michigan's 13th House District on Tuesday, defeating three other candidates, including a write-in campaign by Detroit's City Council president, Brenda Jones.